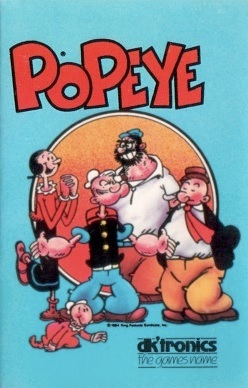 Popeye is a platform game which was initially released by DK'Tronics on the Sinclair ZX Spectrum in 1985, and later on the Amstrad CPC and Commodore 64 in 1986; it is not a conversion of Nintendo's 1982 arcade game (a ZX one was developed by Amazon Systems for Parker Brothers in 1984, but it was never released). Its designer, Don Priestley, later went on to design Benny Hill's Madcap Chase (starred the comedian of the same name, 1924-1992) and The Trap Door (based on the 1984 CMTB Animation and Queensgate Productions television series of the same name) for the same computers - and the latter also gained a sequel named Through the Trap Door that had two playable characters. This page was last edited on 17 October 2016, at 18:36.